Check on the clubs' respective websites for the correct day and time. 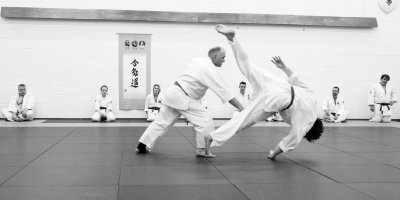 We recommend that you arrive 10-15 minutes before the start of the training session so you can have a quick introductory chat with sensei and fill in some eventual paperwork. The main thing would be to meet the main coach for a quick chat and meet some of us. If in doubt, just ask anyone present, all members are keen to help newcomers. Follow everyone else onto the mat (it is customary to make a little bow as you come onto the mat) and we all line up facing the teachers. We line up in grade order, so typically in our dojo, the beginners are at the end of the line nearest the entrance. The highest grade present will say “seiza”. This means “sitting properly” and is everyone’s cue to kneel down. Shortly after, he/she will say “Sensei ni rei”, which means “bow to the teacher”. We all bow forward to the teacher, while they bow toward us. There is no religious or political meaning for this, it is simply the Aikido way to show respect and say “thank you for being there”. Once warmed up and stretched, we often do some more exercises such as sit ups, press ups or any other kind of torture the teacher can come up with. Don’t worry if you can’t do everything, only do what you can. You won’t be told off if you need to stop for a breather. Your stamina will improve in time. Suddenly, you’ll see the class either line up or form a circle, then start to do some kind of line dancing while shouting some weird foreign words. No, we’ve not gone mad (although, if the teacher has a cowboy hat and some country music is playing in the background, you might be in the wrong club). The foot movements form the basis of many of the techniques you’ll try later. 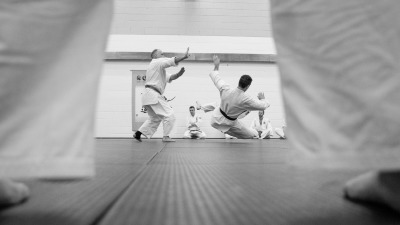 The first rule of aikido is “move out of the way”. The teacher will show you the basics so you can try to follow. All too quickly, you all line up again and by looking at the clock, you realise two hours have slipped by – it doesn’t seem like it!. After a couple more bows, you make your way off the mat (bowing again to the mat on the way off) .When all is done, you start putting your shoes and socks back on, feeling warm and slightly tired – but feeling like you’ve really learnt something different, and that you’re now part of the group. The four sessions are free. You try before you buy. Practice fees are listed in the payment option section of this website. 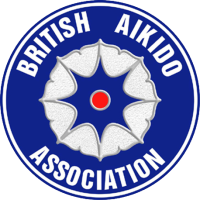 Once you have decided Aikido is for you, you will need to buy a gi and join the British Aikido Association. Don’t worry, you don’t have to decide straight away, for the first few sessions, you’ll be covered by the club’s insurance. We prefer to give you time to make your mind up, and we believe that one session is not enough. Finally, remember that the main skill you will need is not fitness, strength, speed or ability to do amazing acrobatics. The most important thing is patience. After all, a black belt is just a white belt that stuck to it for long enough, nothing more. 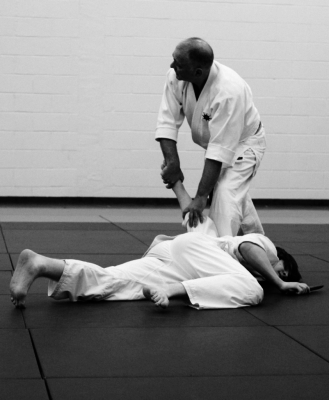 - respect the Sensei by following his/her instruction whilst in the dojo. 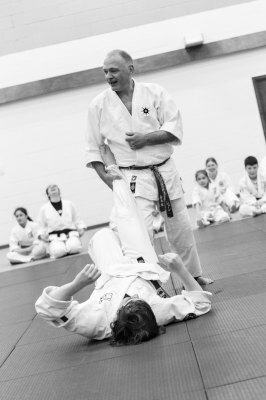 Under no circumstances should students chat whilst Sensei is demonstrating technique. 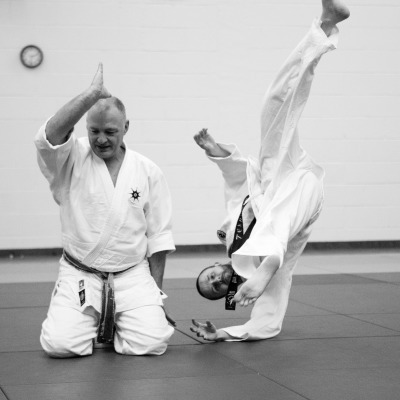 - respect the Sensei and fellow students both inside and outside the dojo environment at all times. - keep the Sensei fully informed, as a matter of courtesy, of any activities which relate to Aikido both inside and outside the dojo. 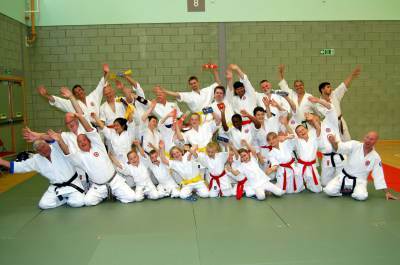 - act as ambassadors of the dojo whether inside the UK or abroad. - have full insurance cover so as not to compromise fellow students and to ensure they are fulfilling their obligations to the Sensei, Dojo and BAA requirements. 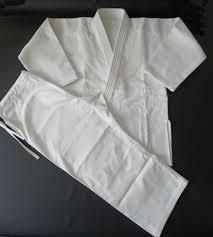 - advise the Sensei of any disability and to ensure this is detailed in the dojo membership form. such jewellery could cause harm to a fellow student, the student will unfortunately not be able to train. Health and safety in the dojo has to take priority at all times. Please ensure your gi is clean and smart at all times. 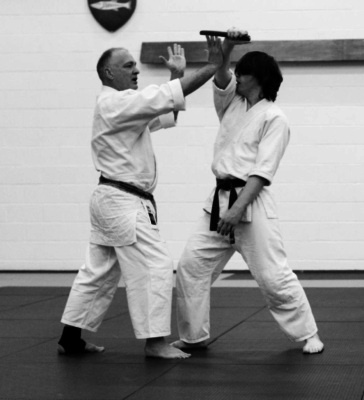 Tomiki Aikido classes will include the use of weapons (Bokken, Jo & Tanto) students are expected to bring these weapons to each class. Weapons in an unsafe condition will not be allowed in the dojo. Please remember all members are ambassadors of the Shoshinkan dojo and, as such, are required to be on best behaviour at all times when attending events, courses and seminars.